YASED Chairman Ahmet Erdem said: “We would like to congratulate Mr. Recep Tayyip Erdoğan, who was re-elected as our President, and all the candidates elected as Parliament Members for the 27th Period. We hope that this new period will bring luck and prosperity to our country and nation. In this new period, prioritization of policies that will boost international direct investments (FDI) is more important than ever for our country since such investments critically contribute to the efforts to increase our country’s export volume, position it as a regional investment hub and ensure sustainable economic growth. Therefore, as YASED, we will continue to contribute to the efforts to make our investment and business environment more attractive and efficient in terms of international direct investments (FDI). 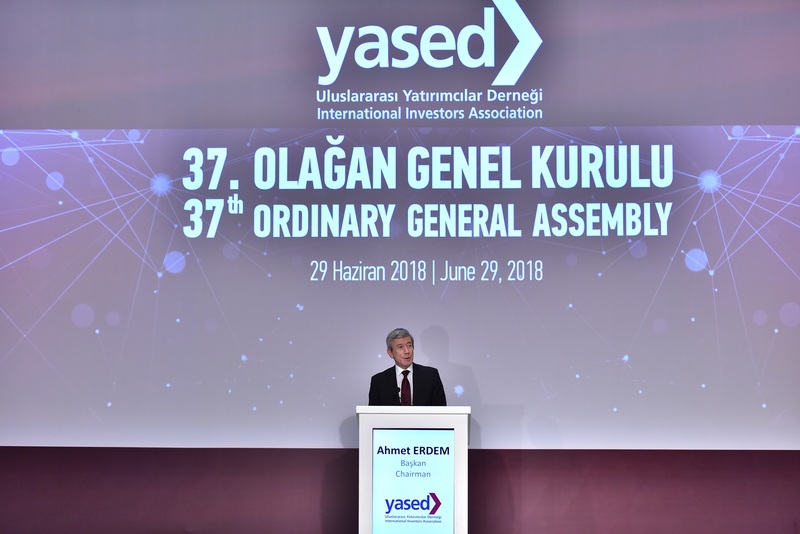 The 37th Ordinary General Assembly Meeting of YASED was held in Istanbul on June 29, with the participation of Nihat Zeybekci, Minister of Economy. Delivering a speech at the opening of the General Assembly, Zeybekci stressed the contribution of international direct investments (FDI) to Turkey’s development. YASED President Ahmet Erdem explained that the June 24 election was followed by Turkey’s transition to a presidential system. As YASED, we wish that Turkey will welcome the future with prosperity. We also wish that our country will assume it as its number one priority to take measures in the field of the economy, while rapidly taking the necessary steps. We expect our country to adopt economic and macro reforms to integrate our country into the global economy, ensure a sustainable flow of investments and enhance our global competitive power across any field. He added: “We believe that continuous growth of the Turkish economy requires sustaining the efforts to improve the economic landscape, without slowing down. This can be achieved by paving the way for international investments. Therefore, prioritization of policies that will boost international direct investments (FDI) is more important than ever for our country since such investments critically contribute to the efforts to increase our country’s export volume, position it as a regional investment hub and ensure sustainable economic growth.